Tom is back on Discover in fine form with this two track EP which pushes the production bar even higher. Both tracks effortlessly merge drive and melody to once again give us Tom's trademark "Discover" sound. Already heavily supported and licensed to appear on compilations from Sean Tyas, JOC and Eddie Halliwell, we expect this to be one of Tom's biggest releases to date. For 2009 Tom will be unveiling his new production alias which will be exclusive to the Discover label's and promises to deliver some interesting twists and turns to the powerhouse Colontonio production stable. Paul Van Dyk, Armin Van Buuren, Tiesto, Eddie Halliwell, Solarstone, Graeme Gold, John Askew, Greg Downey, Sean Tyas, Mark Sherry, Thomas Datt, Manuel Le Saux, John O'callaghan, Jon O'Bir, Chris Hampshire, Alex Morph, Woody Van Eyden, Ian Betts, Mark Sherry. 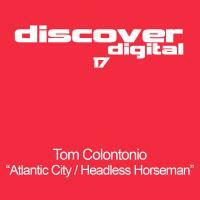 'Atlantic City' is available now from Beatport and iTunes.